← Goats In Villages Wine. No, Really. Happy Friday, everyone! Malbecs have been making their way into my shopping cart lately. As I’m not entirely sure what the heck a Malbec is, or if I enjoy them, I thought I’d turn to my handy-dandy EVERYTHING GUIDE TO WINE by Peter Alig, the Wine Educator at Robert Mondavi Winery (or at least, he was when the book was published). Peter says that Malbec is the fifth of the five noble Bordeaux varieties, but heck – the grapes are finicky in their native land of France, and usually fall ill to some disease or another which makes planting that grape a risky business, indeed. But apparently Argentina has taken up some of France’s slack, with California also sticking its toe into Malbec (eh – so to speak, lol). The Malbec grape is known “for its density, dark fruit, and backbone of tannins” according to Peter Alig. It’s also used primarily as a blending grape in France and California. I managed to find two under ten dollars – let me tell you about them. 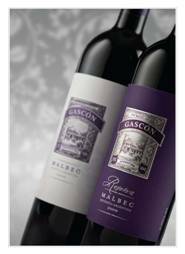 On the Label: “Since 1884, the wines of Don Miguel Gascon have been recognized for the rich, smooth flavors that come from Argentina’s Mendoza wine region. High altitude vineyards situated along the Cordillera of the Andes Mountains produce full mature grapes for this classic Malbec. It is full bodied and elegant with soft, round tannins, layered with favors of blackberry, blueberry, dark cherry, and a hint of mocha.” Visit the winery here. My Take: For me, this is a young wine. It’s still really bright, and the tannins are a bit harsh. I’ll be keeping an eye out for it, though, next year; hopefully that aging will have smoothed out the bite and kept the nicely juicy flavors. My Rating: ~ Drinkable ~ But it’ll be better in a year. 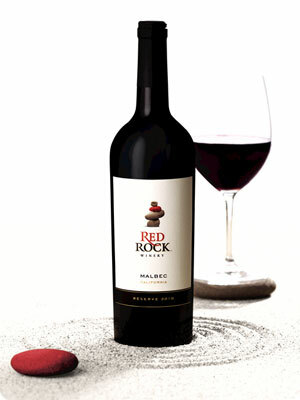 Red Rock Winery Malbec Reserve 2010 Healdsburg, California Alcohol 13.6% by Volume Regularly $11.99; on sale at Vons for $8.39. My Take: Okay, I confess. Once I read that this winery is all about Find(ing) True Balance, I giggled the rest of the way through the label. If you drink wine, inevitably your balance will leave you at some point. Even a sip or two on an empty stomach (MAINLY for us FEMALES) can send you reeling a bit. So, yeah. That struck me as truly (unintentionally) hilarious. These people seriously need a normal person to check their writing. Just saying. Oh yeah – about the wine. Young. Meh. Not bad, just nothing to get too excited about. If I’m drinking reds, I prefer Pinot Noirs or Zinfandels. So…maybe this will be better in 2013? My Rating: ~ Drinkable ~ Note: Their website says that the 2009 was blended with other grapes for more depth. If you can find it, try that one first. That’s it today folks. My back is killing me and I’ve still got edits to do. While you’re here, check out Demon Soul and the Caine Brothers Series page of my website – reviews are up, too. Remember, this is all just my opinion and will be colored by how many political calls I’ve dodged, whether or not I’ve donated blood in the past week, and if my cat is meowing to be fed. Your taste buds will differ. Thanks for stopping by – and remember to Drink Responsibly! This entry was posted in Uncategorized, Wine Friday and tagged 2010, Argentina, Caine Brothers, California, demon soul, Don Miguel Gascon Winery, Healdsburg, Malbec, Mendoza, Red Rock Winery. Bookmark the permalink. 14 Responses to What the Heck is Malbec? I had no idea what a malbec was. I’ll have to check the wine shelves to see if we have it down here. I hope the back gets better soon and that the edits go well. Happy writing. Thanks, Shelley – the edits are done and the back is blech. Cheers! Christine, several of my friends and I have grown to love Alamos Malbec. It’s Argentinian, priced below $10, widely available (picked some up at Trader Joe the other day). It’s mellow and rich and I think very smooth. Nice sipping or with a meal. I’m going in on a case of it with a neighbor. Give it a try! I will definitely check into the Alamos Malbec. Thanks, Nancy! I am going to go and see if I can find an Alamos Malbec, Nancy. Trader Joe’s is in walking distance and I have to get some coffee today, too. Hadn’t ever heard of this type of wine, but having a preference for reds, I’m going to give it a try. Sounds like I need to wait on these and heed your other suggestions! Hey Brinda, BTW I LOVED “The Waiting Booth”. Devoured it in one sitting. Terrific book! I’d never heard of this kind of wine before your post. Curious. I don’t know if I get the husband to try this or not. You have me intrigued. I’m like everyone else, I’ve never heard of this wine. It might be a bit strong for me. I’ve got a weird stomach, and the older I get the less things it likes. : ) But maybe if I get a bottle to share with friends and then have a sip or two…. I am an American living in Argentina. I am also a certified wine educator and the author of several books on wine and the wineeducation.com web site. I mention this as an introduction. the tannic Malbec of France has little relation to the wines that a produced from Malbec in Argentina. Here they are full of soft dark fruits, and at their best, a hint of black pepper. They are similar in style to a good California Zinfandel. The ideal growing conditions here in Argentina, combined with low labor costs and the economy in general makes Malbecs an amazing buy. If you like your reds to be easy to drink and well priced, and who doesn’t, then you need to explore these great wines. If you are looking for a place to vacation where your money goes further and the people are genuinely happy to see you, think about visiting Mendoza. There are lots of wineries open to the public, and plenty else to do as well. And since the seasons are reversed it is a great place to escape the weather. It is warm here when it is cold in the North, and while it is cool here wheat is hit there, it rarely gets very cold with snow being a rarity, except on the nearby ski slopes in the impressive Andes Mountains. Thanks for stopping by and commenting, Stephen – I really appreciate it. Argentina, and Mendoza, sound like terrific places to visit. I’m definitely putting them on my list. Malbec is not just Argentina. As you say Christine there are Malbecs from France and California. The best ones from France I think are the so called black wines of Cahors. Cahors is a beautiful city and wine appellation in South West France. In contrast to the Argentinian Malbecs, those from Cahors are softer, richer almost velvety in texture. Australia too makes wine from Malbec, most commonly in blends with cabernet, etc. Over the past few years varietal Malbecs have become more popular. My Vinodiversity website lists over a hundred Australian wineries making wine from this interesting variety. I’d love to check out a Cahors Malbec, but I’ll bet they don’t ship to California. But I’ll definitely ask about. Thanks, Darby, for coming by and commenting – I do appreciate it! Try wine.com they have a few Cahors, mostly under $20, and they ship to CA. I don’t think I can advise about Aussie Malbec’s in the US.